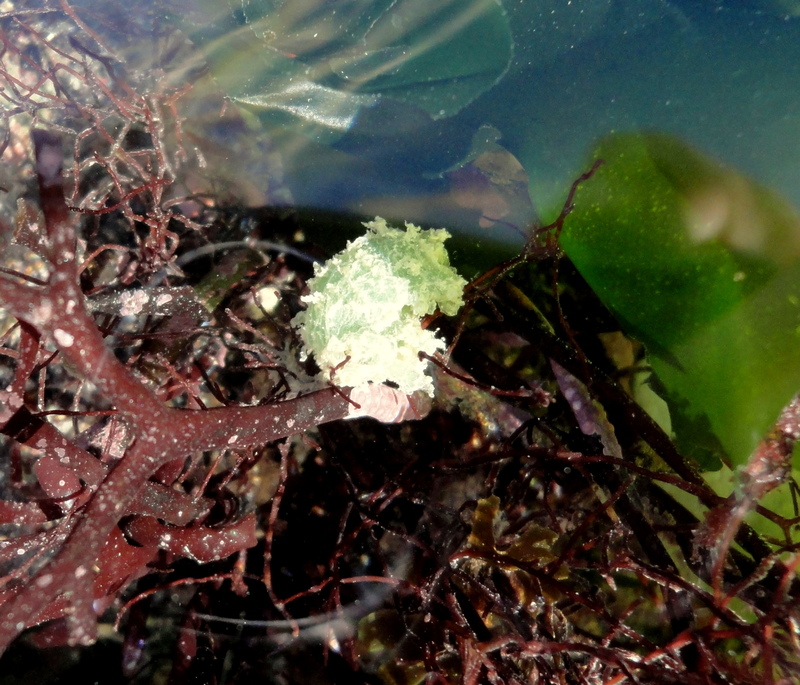 There are eggs everywhere in the Cornish rock pools this time of year and the warm weather and high pressure have provided perfect conditions for finding them. Fish eggs among the rocks – when you look closely you can see the little eyes staring back at you. 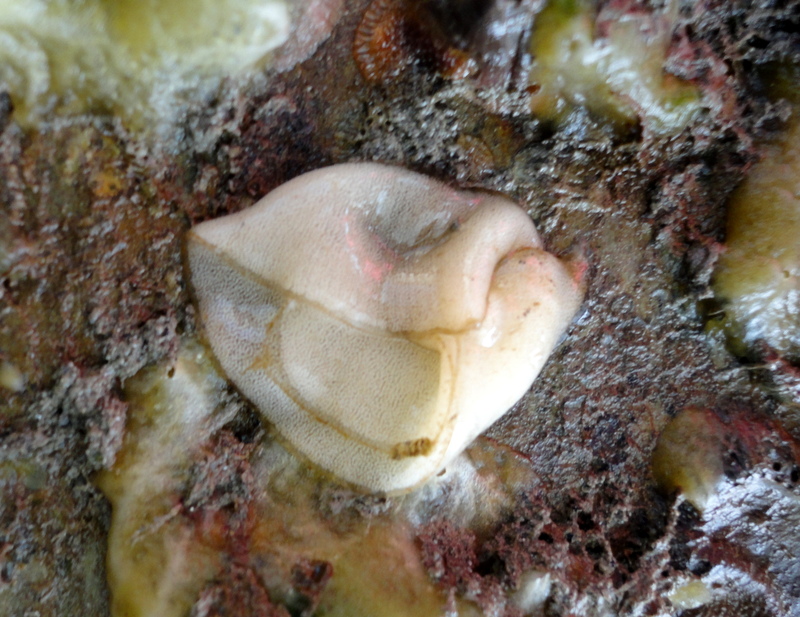 Fish have moved inshore to protect their broods, crabs are carrying great mounds of eggs under their tails and sea slugs have started to lay their distinctive neat egg coils. 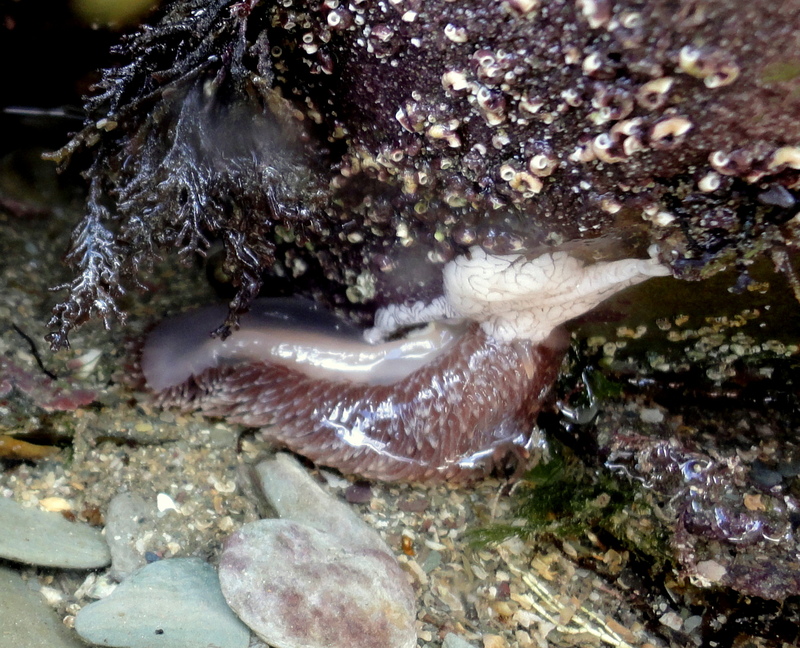 A great grey sea slug laying eggs. 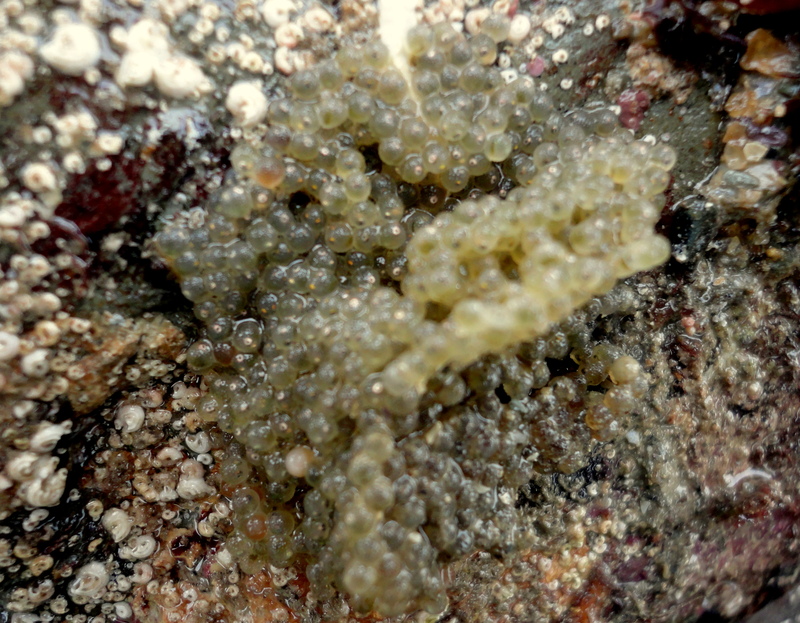 Blobs of ‘snot-worm’ eggs from the green leaf worm family adorn the seaweed. The seas are also unusually summery for April. Currents of plankton-rich water have brought in large numbers of barrel jellyfish. Also known as dustbin-lid jellies, these creatures grow to nearly a metre across. 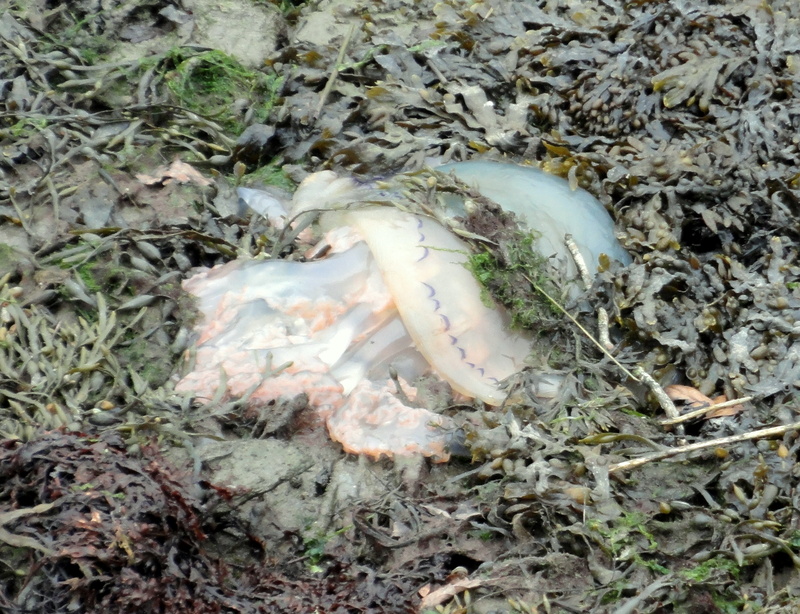 Many of these harmless jellyfish (but perhaps not billions as the Daily Mail reported) are arriving around southern coasts and this week we’ve seen several stranded around Looe. A barrel jellyfish stranded by the Looe river. The first basking sharks have also been sighted around Cornwall, suggesting that we might have a longer than average season in which to spot these summer visitors. As I walk on the cliffs I keep a hopeful eye out for their distinctive fins. 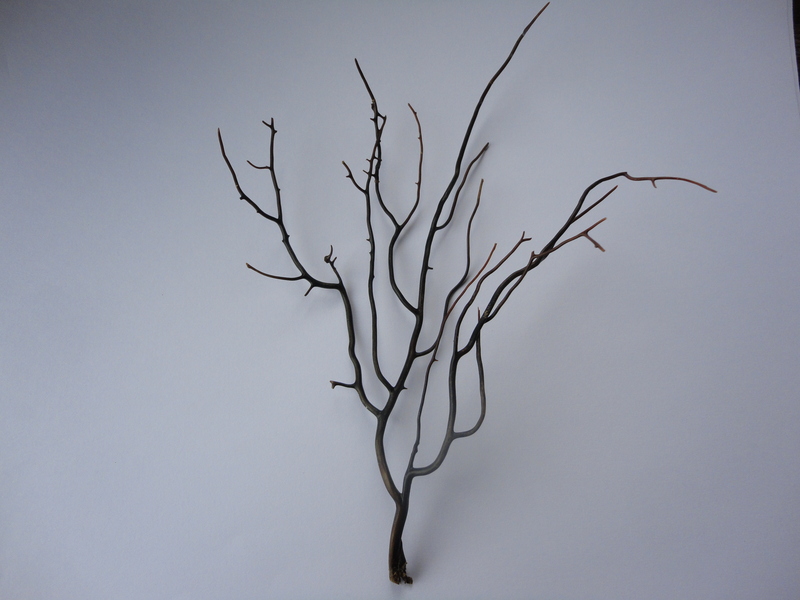 On the shoreline, there have been lots of ray and shark egg cases coming in and on one walk I spotted this lovely skeleton of a pink sea fan. Sea fans are delicate branching colonies of tiny anemone-like polyps. They grow just 1cm per year and are very vulnerable to trawling. This one is probably around 20 years old. With the warm weather set to continue and some great low tides coming up this weekend, there are sure to be more exciting finds to report from the Cornish rock pools soon. You’re so lucky to live in such a wonderful part of the country. Last summer we saw a barrel jellyfish swimming under a long pier leading to a lifeboat station. It was huge! They’re amazing aren’t they. I love reading your blog too. If you and Bug Mad Girl ever fancy a rockpooling trip to Cornwall, just give me a shout. Would love to. I’ll let you know if we ever make it that far south! Great stuff! Can’t wait to go to Cornwall from July 3rd to July 10th. Where about are these rock pools that you go to? They seem like really good places. Thanks Sean. There are lots of great beaches all around Cornwall. These photos were taken at Hannafore Beach in West Looe and Plaidy Beach near East Looe. If you look under the ‘beaches’ tab ( https://cornishrockpools.com/beaches/ ) there’s information about some great places to explore the rock pools, but there are many more too. I’ll try to add some more this summer. Do you know which part of Cornwall you’ll be staying in? I hope you have a fantastic holiday. Great – I’d recommend you try one of the south coast beaches as the sheltered environment makes it relatively easy to find lots of species. If Cornwall Wildlife Trust or the local Marine Conservation Groups are running any rockpooling events when you’re down try to join one of those – that way you get to see everyone’s finds and have people on hand to identify everything. Hope you have a wonderful holiday.